The Bicycle & Pedestrian Advisory Committee (BPAC) will meet on Thursday, July 20th, at 6:00 PM. The Committee will discuss the upcoming Bicycle & Pedestrian Action Plan as well as enhancing school speed zones near all CCUSD schools. The full agenda is posted here. Note: The meeting is at Veterans Memorial Park instead of City Hall this month due to the Summer Concert Series. Where do you want a Metro Bike Share station? On June 26th, the Culver City Council voted unanimously to join the countywide Metro Bike Share system, with an estimated launch date in mid-2018. 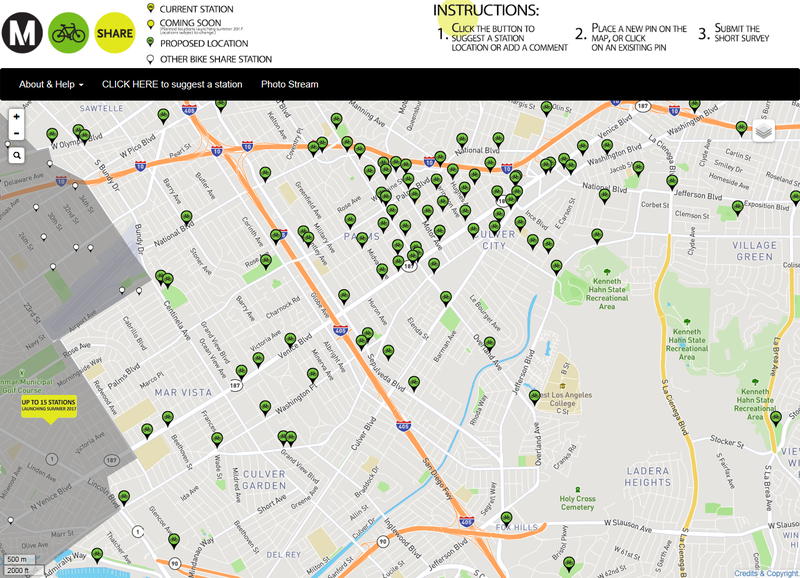 In partnership with the City of Los Angeles, the new system will place over 600 "smart bikes" throughout Culver City and the nearby Los Angeles neighborhoods of Palms, Mar Vista, Del Rey, and Playa Vista. The City has begun a yearlong planning and implementation process and we need your input to make this system a success. Please let us know where you'd like to see bike share stations by participating in Metro's crowdsourced station planning map. On this map, you can drop pins on places you think would make for good station locations and you can vote other people's suggestions up or down. Your suggestions will be the starting point for our station planning beginning next month. For more information about the proposed bike share system, download the full Bike Share Feasibility Study report here. If you are interested in mobility near the Culver City Expo Station, you have likely been following the TOD Visioning Study process. After several months of study, the consultant team will present their recommendations at the eighth and final workshop this Wednesday evening, July 19th, at 7:30 PM in Council Chambers. For more information about the study, go to www.culvertodvision.org. You are receiving this message because you opted-IN to receive the City of Culver City information by e-mail. Update your subscriptions, modify your password or e-mail address, or stop subscriptions at any time on your Subscriber Preferences Page. You will need to use your e-mail address to log in. If you have questions or problems with the subscription service, please contact subscriberhelp.govdelivery.com. This service is provided to you at no charge by the City of Culver City.